As media content continues to proliferate, pre-trial publicity’s potential to negatively impact jury impartiality and decrease the certainty of a fair trial is an ever-increasing concern. In 1995, Queensland became the first Australian State or Territory to implement pre-trial questioning as a measure to address such publicity. In 2014, the Victorian Law Reform Commission (VLRC) determined that Victoria did not require such questioning. This article extends the VLRC’s analysis to suggest that the Queensland – as opposed to United States – version of pre-trial questioning can, in fact, have an important role in addressing the challenge that prejudicial pre-trial publicity poses to courts. The article reviews the reasons for which the VLRC rejected the measure to conclude that, to address prejudicial pre-trial publicity in trials with much contemporary media coverage, Queensland’s pre-trial questioning has a particular effectiveness that the measures which Victoria currently uses do not have. Autism spectrum disorder (ASD) is associated with deficits in social cognition and empathy. In the criminal context, this poses difficult challenges, undermining assumptions about a defendant’s culpability and character and forcing recognition of the impact of social and emotional impairments on decision-making. Drawing on relevant court decisions, this article examines the sentencing response to defendants with ASD. It argues that the condition is raising unique challenges for sentencing judges as ASD’s distinct symptomology is difficult to fit within conventional exculpatory doctrines. It urges awareness of the distinct forensic aspects of ASD, so that courts can appreciate the subtle and often counterintuitive elements of this condition and their relevance to the sentencing process. 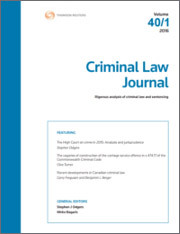 For the PDF version of the table of contents, click here: Crim LJ Vol 41 No 3 Contents.